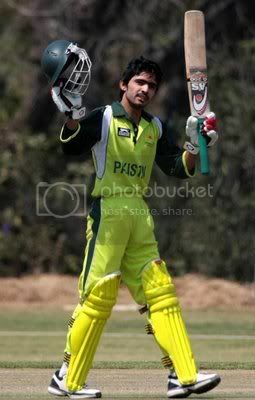 Fawad Alam is one of the many players whose career I have followed closely. In my previous post about Fawad, I talked about his rise at the U19 and domestic level that led to his inclusion in the Pakistan side and described his prolific domestic run scoring. In that post I also mentioned how he was one of the most under rated cricketers in Pakistan. Fawad's recent performances for the Pakistan Academy on its tours to Zimbabwe and Kenya in August and September were exceptional as he ended both the tours as the leading run scorer on either side. He continued his good run of form in the recently concluded RBS National 20-20 Cup, and has shown glimpses of that in the ongoing T20 Quadrangular in Canada. I called him the finisher in my previous post and he proved just that against Sri Lanka two nights ago as he smashed an unbeaten 23 off a mere 9 balls to lead Pakistan to a nail biting victory. On the Academy tours, however, he showed that he can also be the anchor and the team's primary batsman. Fawad batted at number 3 or 4 for the Academy team and with every match looked a better batsman. He started the Zimabwe tour with scores of 55 and 5* in the Academy's 202 run victory in the first 4-day match and followed that up with a 101 and 9 in the next match, which the Academy also won (by 6 wickets). In the 3 ODIs that followed, Fawad knocked 4, 68, and an unbeaten 100 in comprehensive victories for the Academy side. By the end of the tour Fawad had piled up 342 runs at an average of 68.40 in 7 innings. The tour of Kenya started with a 4-day game, in which Steve Tikolo's 170 and 94 had set the Pakistan Academy an unlikely target of 364 with 3 and a half sessions to play. Fawad was in his element again maintaining his outstanding form while stroking an unbeaten 108 on the last day of the match to lead the Pakistan Academy to a 4 wicket victory on the final evening of the match. Having hit 3 centuries in his last 5 matches against Zimbabwe and Kenya, Fawad was looking in supreme touch going into the second 4-day match against Kenya. What one witnessed in that match was a repeat of what two 16 year olds by the name of Sachin Tendulkar and Vinod Kambli had done almost 2 decades ago. Kenya had been bowled out for 209 very close to the end of days play on day 1. Pakistan's reply began in unconvincing fashion as Khurram Manzoor walked back to the pavilion at the end of the 1st over. That brought Fawad Alam to the crease in only the 2nd over of the innings. A day and a half later, as the Pakistan Academy declared on 665-2, Fawad Alam and Raheel Majeed had added 612 runs for an unbroken 3rd wicket partnership, with Fawad on a career best 302 and Raheel on 318. The Pakistan Academy also ended the Kenya tour unbeaten sweeping the ODI series 3-0. With scores of 83,14, and 25 in the 3 ODIs, Fawad ended the tour with 554 runs in 6 innings at a remarkable average of 138.50. In the ongoing T20 Quadrangular in Canada, Fawad did not play the 1st match against Canada. He played the next against Sri Lanka but came to bat at number 9. And in the next against Zimbabwe he just walked out to bat to hit the winning runs. Though he won the match for Pakistan at number 9 agaist Sri Lanka, I think that is too low for a batsman of Fawad's quality. There is no doubt in my mind that he needs to bat in the top 6. Not only in 20-20 cricket but in ODIs and test cricket as well. This is the best time to put Fawad at the deep end. He has a very impressive first class record and he is at the top of his game at the moment. The question though remains - how does Fawad fit into the top 6 of a Pakistan line up? I agree with you, I don't like Shoaib Khan. He had problems timing the ball and he looked very underconfident. Nasir Jamshed was easily the best option. Khurram Manzoor, I am not sure how his performance is in T20 cricket. I dont think Nasir was even in the original squad that was decided by Salahuddin? It's strange that sometimes deserving players get unlucky and mediocre players like Shoaib Khan can score a 50 after getting so many lifelines and chances. As they say, what goes down on paper is important and to the world Shoaib Khan has scored a 50 in his 3rd match only and will be hailed as the next big thing. He might become the next big thing, but he looks very unimpressive from what I've seen of him so far. Q. correct me if i'm wrong.. isn't he a wicketkeeper also... which in that case, should easily come in for Akmal. No Scorps, he's not a wicketkeeper. Never was. He bowls left arm occasional spin. Khansahab u had talked so much abt Fawad Alam that I thought I should just do a post on him. I think u shud put all ur comments regarding him here. What I dont understand is why wasnt Nasir Jamshed selected. There was no reason to include Shoaib Khan and Khalid Latif. If they needed openers the best options were Nasir and Khurram. Either way, back to Fawad. How does he break into the top order? Who was that u19 keeper who has nominated to replace Kamran? He played in the IPL too. The headaches begin when you consider odis and the fact that Yousuf returns to the team. Does Fawad even get a look in then? I'd play him, but who to leave out? Scorps, that was Sarfraz Ahmed. Khansahab, I agree with you - Fawad is not a threat to Afridi. If Fawad is to play for Pakistan he needs to play as a batsman who bowls a bit. Remember Afridi is a bowler first, while Malik was also a bowler who transformed himself overtime. He's not a replacement for Malik either, who is one of our most dependable batsmen. Drifting Down - welcome to Well Pitched. The top 6 that u mention works for 20-20. In the blank openers space I would put in Nasir Jamshed. With Fawad at 6 and Afridi and Akmal to follow it gives a strong batting line up. As for ODIs and Tests and Yousuf coming in at 4 I believe the only option is for Malik to open. Shoaib Akhtar needs to be kicked out of the team. We need to discuss what the hell needs to be done about Shoaib Akhtar.....he bowled very inaccurately and only concentrated on pace. He has done that in the past and let the team down on many occasions. He is the most experienced bowler and he is also the strike bowler, surely we needed him to use his brains. This kid has a bright future, I was not excited about his batting we all know he can bat, I am happy that his bowling is improving he has to work a lot on his bowling, we do not need another incomplete single dimensional allrounder like Malik or Afridi, although Malik has improved his bowling and is consistently performing with the ball. As I said before the tournament started we needed a hard hitting batsman like Nazir, or Nasir jamshed at the top even Khurram Manzoor was a better choice than Khalid Latif and Shoaib Khan but Mr Najammuddin Khan the sports minister he fucked the whole selection process.Younis Khan should not be included in T20 I have said it many times, Fawad should bat higher and we should find another hard hitting batsman down the order. Shoaib Akhtar is responsible for today's defeat he tried to get a wicket through sheer speed but failed, his fitness and form needs to be scrutinized and if he is not fit then he should sit on the sidelines. Mohammad Amir should have been selected for this tour,I hope the selectors will not make any blunders next time. I agree that there were selection issues going into this tournament and I don't think they will ever get sorted out. What I don't understand is, why did Malik play Shoaib Khan in all the matches? Shoaib Akhtar was unlucky in the over he bowled at the end - 3 edged boundaries but why wasn't he bowling any slower deliveries? Where r the brains? But we were also unlucky - Guls LBW might have changed the match a bit. I said this even before this tournament started that Malik will play Shoaib Khan in all matches. That is because Malik himself was behind Shoaib's selection. I don't know why the Sports Ministry pushed for Khan's selection but there were rumours that Khan is the first Baluchi guy to play for Pakistan and that is why they wanted him to have lots of opportunities. About Fawad Alam, I don't think his bowling will improve because he is a batsman who can bowl- to call him an all rounder like Abdul Razzaq or Shahid Afridi is an insult to him because he is a proper batsman. I said before his batting stats are at par with people like Yousuf and Misbah. So how can you expect him to bowl like Afridi or even Malik? He can only do that if he was as talented as someone like Garry Sobers. Umar Gul lost his cool in his first over and got smacked for many runs, but apart from that he was good. The main reason was Shoaib Akhtar. If Malik was a smart captain he would have told Akhtar to cut down on pace and focus on line and length. You can bowl to Jayasuria at 100mph if you want but if you are bowling on his pads, he will hit you. Khansahab - last night Alam bowled as well as Afridi and Malik. Why did Malik want Shoaib Khan in the team? Gul and Akhtar needed to be more calm and needed to bowl more slower deliveries like the Lankans. Malik clearly stated that he was not happy with the selection when the team was announced his discontent was published in all the papers,I can't understand why you are so sure that he was Malik's choice, the guy has some big pawa at the sports ministry which forced his inclusion in the team at the 11th hour and also making Malik to play him in all matches. I hope you have some proof supporting your categorical statement that Malik wanted Shoaib Khan in the team, any news in the media, any report on the internet, or it is just your rumor mill working against Malik as usual. Interesting point Wasim. Actually I haven't read Malik speak for or against the selection so Im really not sure what his views were. My 1st impression was that Malik would not have been happy but if that was the case then why did Shoaib Khan play all the games when Malik usually prefers Kamran Akmal to open. Plus Afridi had also said he wants to open. Was someone else dictating the playing XI? I agree anon, Nasir needs to be there. But Shabbir? Really?